How to choose the right manufacturer to fabricate your glass, polymer or PDMS microfluidic device? When dealing with research in microfluidics you have to choose first the right material for your microfluidic experiment. 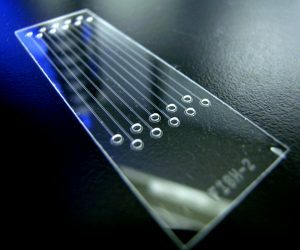 Once you have chosen your material, if you don’t fabricate your microfluidic device by yourself, it is relevant to choose the right manufacturer to fabricate your microfluidic chip. You can choose between number of different types of manufacturers. They all have their advantages and drawbacks depending on your requirements in term of resolution, chemical compatibility, application… Here we will present the main microfluidic device foundries with a short description of their offers. microLIQUID is a company that designs, prototypes and manufactures dispossable microfluidic cartridges for the IVD, VET and Point of Care industries. microLIQUID has also developed a range of devices to adapt Elisa-style tests perform in the lab to point of care analysis, opening a window for commercialization of the test in environments where immediate availability and fast results is necessary. MicroLIQUID does not enter the IVD, VET or POC markets, microLIQUID is offering a new tool to those companies in this markets that can be used with a range of samples (serum, salive, urine) to obtain quantitative or qualitative assays in nonlaboratory locations. Micronics provides custom design and development services – including prototype to commercial development of stand-alone disposable cartridge/instrument systems.